WHY I LOVED IT: It’s the Rolling Stones—what’s not to love?!?! How many groups do you know capable of releasing an album erected from crumbs and leavings of former studio recording sessions and turn it into a timeless production? By the time this album was released in 1981 the Rolling Stones were one of the precious few bands of the 60s/70s golden era of hard rock and roll to make it to the finish line and stay relevant into the MTV/Rubik’s Cube/Ronald Reagan era. Was “Tattoo You” better than the previous 17 American studio albums that preceded it? Not by a longshot. That doesn’t mean this effort wasn’t enjoyable. “Start Me Up” became one the great sports arena pregame anthems to get players and fans properly amped. I want to confront all my mortal enemies every time I hear it. It may not be my favorite Stones song but it’s easily makes my top 10. I didn’t like “Waiting on a Friend” for quite a while but like most tunes by the Stones, it grew on me. “Slave” and “Little T &A” are underrated and catchy. For all intents and purposes “Tattoo You” was a hidden gems compilation masked as a studio album—and I’m perfectly good with it. COMMERCIAL SUCCESS: Despite the album being largely a collection of studio throwaways that didn’t make other albums from the 1970’s, “Tattoo You” went on to be a huge commercial success. The album sold more than 8.5 million copies worldwide including over four million in the United States and reached number-one on the Billboard Top 200 and stayed on top the United States for seven weeks. It placed on the year-end Billboard Top Album charts both in 1981 (22nd) and 1982 (11th). “Start Me Up” climbed as high as number-two as a single on the Billboard Hot 100 while “Waiting On A Friend” peaked at 13. 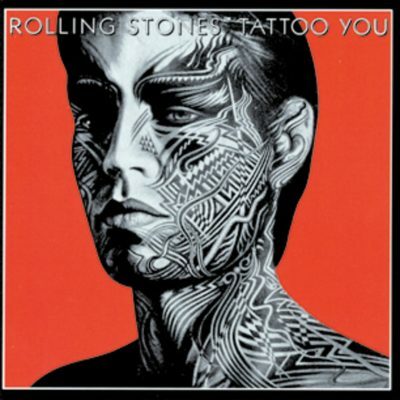 Rolling Stone magazine rated “Tattoo You” as the 34th best album of the 80s. I think that’s a little (or a lot) high.